– Check out this piano for beginners web site on how to play by ear. – Lola puts new light on piano lessons for small children. – If you havn´t heard her music yet I strongly recommend it. I suppose you say that this singer songwriter pianist fits in loosely along with Kate Bush and Tori Amos. Her New album has great reviews but I am yet to hear it myself. 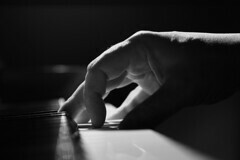 Beginners piano might seem difficult at first but you can break it down into simple logical steps so that it diesn’t have to be that daunting. First off you can learn the notes. Find out that there are only really 12 notes and then the pattern starts repeating. Then you can learn a few basic chords. Discover that with just a couple of simple patterns you can apply to each note you will be able to play all of the major and minor chords in any key. What are cool piano chords? This is obviously objective but, in general you have the major chords which sound happy, the sadder sounding minor chords. Then you have the ambiguous 7th chords. Now come the ‘cool’ chords. if you start adding the 9th, the 11th and the 13th to a chord then you start getting more jazz like sounds. The 13th chords even start to sound a little impresionistic and were used by Satie and Debussy.